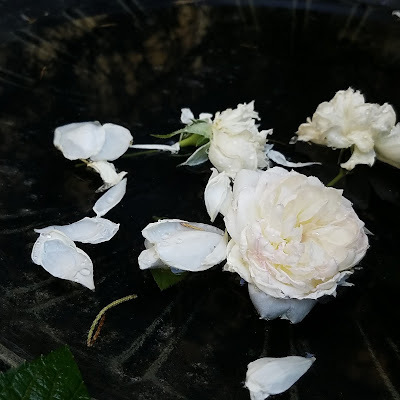 I pruned the spent roses from our bushes this afternoon and floated them in the fresh water of the birdbath. I got this idea from an online friend who places her dying roses in the arms of her Saint Francis garden statue. There is still so much beauty in these little flowers, so it makes me very happy to continue to enjoy their loveliness for a few more days.